Note: the tooltips in the quoted text boxes do not reflect the current changes to the abilities they describe. Since 4.0.1 changes were even announced, I was overwhelmed with anticipation to try a Holy spec. Now, I’ve been Discipline since before Wrath of the Lich King dropped, and I’ve loved the entire playstyle (minus that “bubble spam” thing). When I saw the Chakra ability, as well as the corresponding Holy Word: Chastise states, I started to digitally salivate. 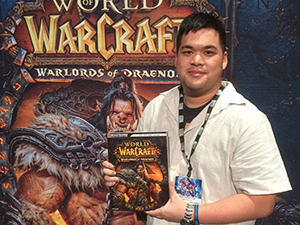 I’ve always enjoyed classes that had a wealth of abilities to use (which is why I never rolled a Paladin — KIDDING!!). In the “lame duck session” before Cataclysm, I’ve been experimenting with the new playstyles and adapting to the new juicy mechanics that have been laid out for us. Chakra Heal has potential to be real potent. 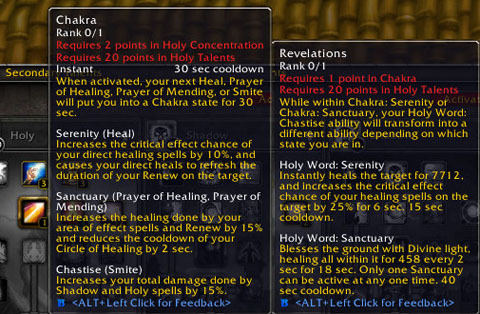 Chakra Prayer of Healing offers a beautiful and useful “stand in the good” zone, as well as an AoE Healing buff. Chakra Smite has been amazing for farming meat, mats, or anything else for which I need to “nuk da mobz”. Effectively, they’ve killed Renew’s exclusivity with Chakra and teamed it up with Prayer of Healing, adding in Prayer of Mending, too. You’ll get more healing out of Renew, but remember that you have to activate it with Prayer of Healing or Mending. You cannot activate your steroid-juiced HoT by hitting that Renew key. Patience, grasshopper. State of Mind no longer affects Renew, affects Prayer of Mending instead. All in all, I’m pleased with the change. As it stands right now, I don’t use Renew Chakra as it is and didn’t see much use in the future. However, as would be my luck, I’ll step into that first Cataclysm raid encounter and think, “Man! I wish I had Chakra Renew back for this fight!” C’est la vie. Do you feel the alteration of Chakra and State of Mind are changes for the better or worse? Are you going to miss the Renew Chakra?